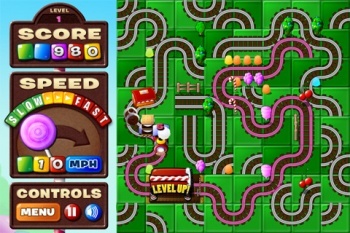 A long-forgotten PopCap game is now available for iPhone and iPad - so come on, everyone, hop on the Candy Train. Back before PopCap was the giant of the casual games industry, it was a website where you could go to play fun Flash games. One of those games was a silly little title where you guided a cartoon locomotive around to collect candy by building the railroad tracks in front of it. It was called Candy Train, and it was actually really fun - though in the wake of Bejeweled, Peggle and Plants vs. Zombies it seemed lost to time. Speaking personally for a moment, I friggin' loved Candy Train back in the day - so much thanks to the lone PopCap programmer who did the work, and for PopCap itself for making it happen. Now make an Android version. Please?